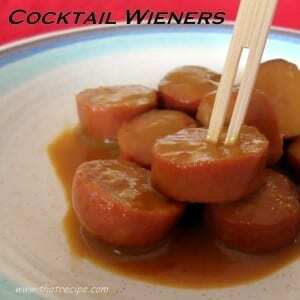 Spicy Cocktail Weiners, dress up simple hot dogs into a spicy and easy appetizer. Blend together mustard and jelly. Pour into sauce pan and simmer until sauce is warm. Add hot dog pieces and simmer on very low heat for about 2 hours. Stir occasionally. Serve in chafing dish to keep warm. Provide toothpicks or cocktail forks for serving.